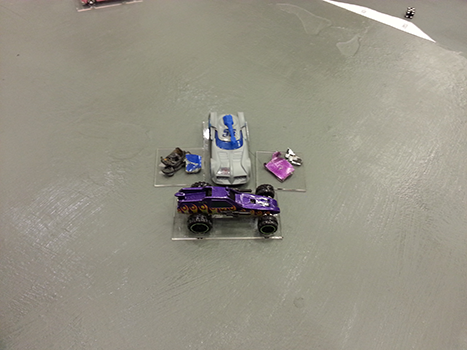 Daily Illuminator: The OrcaCon 3 Car Wars Battle Report! February 3, 2018: The OrcaCon 3 Car Wars Battle Report! 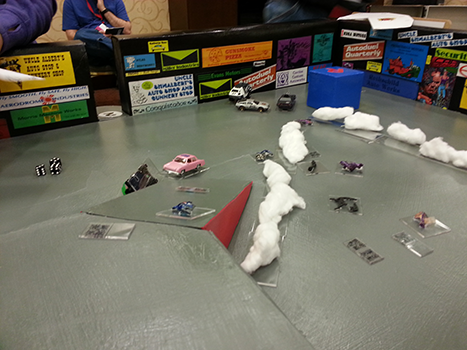 The 3X 3-D Car Wars tournament returned to OrcaCon for its third year, receiving a large, prominent table right by the center doors in the main ballroom. The OrcaCon organizers deserve a huge thank-you for providing this excellent, well-lit location for the tournament. Vying for a seat in the final were 24 duellists, competing over the four qualifier games. Of the 32 seats, 28 were taken; four players in the early games who didn't advance enjoyed the game enough to play a second time, taking open seats. Eight duellists returned again for the final as well. And this isn't counting the numerous spectators who stopped to watch the battle (some for over an hour). 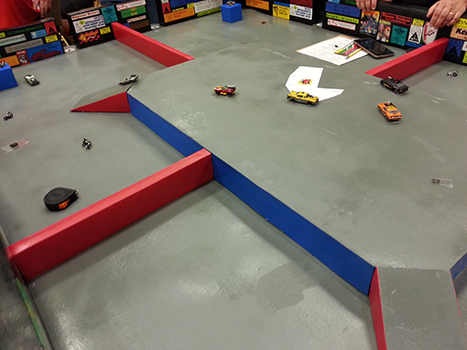 The tournament was played on a triple-scale 3-D version of Dynamax's KEAR Coliseum from the Car Wars Arenas set (formerly known as Warrior Stadium from the L'Outrance book). 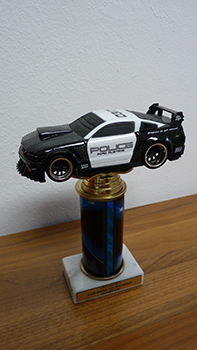 The cars were represented by die-cast cars mounted on clear acrylic bases. Other counters (debris, dropped weapons, etc.) were likewise mounted on acrylic bases. The four two-hour qualifier games used the same car for all duellists – one designed to teach the game, minimize some complexities, and maximize the players' chances to blow things up. The top two finishers in each game advanced to the final (in some cases, a player unable to make it back for the final game deferred their slot to the next placing duellist). The qualifiers included two games of eight players and two games of six players. Action was fast and furious as duellists vied to accumulate kills in the qualifiers. Often, only a single car emerged from the pairs starting from the corners. Rams abounded, fires occurred, cars jumped off the arena's upper deck, sometimes colliding in mid-air(!). Eventually, the qualifying victors emerged. The final was a longer, 4.5-hour game, with the players able to bring their own design or use one brought by the referee. Most opted for the predesigned vehicles. Gamma 25 Compact w/CA Frame, Extra Heavy chassis, Heavy suspension, 100 cid engine w/Multibarrel Carb and VP Turbocharger, Improved Fire Extinguisher, 4-gal. Duelling Tank, 4 Puncture-Resistant Slick tires, Driver w/SWC and BA and Fake Grenade and 2 Impact-Fused Thermite Grenades, Anti-Tank Gun Front w/10 shots APFSDS, Gas Streamer Back w/2 shots Smoke, Heavy-Duty Shocks, Overdrive, Spoiler, Airdam, Sloped Plastic Armor: F105 (Fake Ramplate), L45, R45, B45, T10, U15, 2 5-pt. Wheelguards Back, 2 6-pt. Wheelhubs Front, Acceleration 10, Top Speed 60 +20 w/Overdrive, HC 5 (6 @60mph), 4,440 lbs., $24,997. Rugrat Compact w/CA Frame, Extra-Heavy chassis, Heavy suspension, Large power plant w/SC, Heavy-Duty High-Torque Motors, 4 Puncture-Resistant Slick tires, Driver w/SWC and BA and PFE, Heavy Vulcan Machine Gun Right, Spoiler, Airdam, Plastic Armor: F40, L40, R66, B40, T10, U15, 2 5-pt. Wheelguards Back, 2 5-pt. Wheelhubs Front, Gear Allocation: (44 lbs. @ Accel 5, Top Speed 117.5), Acceleration 10 (x2 w/HDHTMs), Top Speed 120, HC 5 (6 @60mph), 4,396 lbs., $24,843. Bombard Van, Extra-Heavy chassis, Standard suspension, 100 cid engine w/10-pt. CA, Improved Fire Extinguisher, 6-gal. Duelling Tank w/10-pt. CA, Heavy-Duty Transmission, 6 Puncture-Resistant tires, Driver w/BA and 10-pt. CA, Gunner w/HRSWC and BA and 10-pt. CA, 5 Linked Rocket Launchers Front, Tear Gas Discharger Back, Plastic Armor: F53, L30, R30, B30, T5, U5, 2 10-pt. Wheelguards Back, 2 10-pt. Wheelhubs Front, Acceleration 2.5, Top Speed 35, HC 1, 7,198 lbs., $24,955. Pink Mid-sized, Extra-Heavy chassis, Heavy suspension, Sport power plant, Heavy-Duty High-Torque Motors, Improved Fire Extinguisher, 4 Solid tires, Driver w/HRSWC and BA, 2 Linked Heavy Machine Guns in Turret each w/10 shots High-Density, Ice Dropper Back, Plastic Armor: F37, L31, R31, B33, T30, U15, 2 5-pt. Wheelguards Back, 2 5-pt. Wheelhubs Front, Acceleration 10 (x2 w/HDHTMs), Top Speed 122.5, HC 3, 5,756 lbs., $24,982. Trailblazer Luxury, Extra-Heavy chassis, Heavy suspension, Large power plant w/SC, High-Torque Motors, Improved Fire Extinguisher, 4 Solid tires, Driver w/TC and BA, Vulcan Machine Gun in Turret w/14 shots High-Density, Vulcan Machine Gun Front w/10 shots High-Density and 10-pt. CA, Flaming Oil Jets Left and Right and Back, Link (all FOJs), Smart Link (both VMGs), Plastic Armor: F45, L30, R30, B30, T30, U10, 2 4-pt. Wheelguards Back, 2 4-pt. Wheelhubs Front, Gear Allocation: [6 lbs. ], Acceleration 5 (+5 w/HTMs), Top Speed 90, HC 3, 6,594 lbs., $24,965. Nissan Elegance CA Compact w/CA Frame, Extra-Heavy chassis, Heavy suspension, Medium power plant w/SC, High-Torque Motors, Fire Extinguisher, 4 Solid tires, Driver w/HRSWC, Laser Front, Heavy-Duty Brakes, Sloped Composite Laser-Reflective Metal/Plastic Armor: F10/36, L10/30, R10/30, B0/40, T0/5, U0/15, 2 9-pt. Wheelguards Back, 2 10-pt. Wheelhubs Front, Acceleration 5 (+5 w/HTMs), Top Speed 92.5, HC 3, 4,438 lbs., $24,541. Triple Ripple Van, Extra Heavy chassis, Heavy suspension, 100 cid engine w/10pt CA, Improved Fire Extinguisher, 4-gal. Duelling Tank w/10-pt. CA, Heavy Duty Transmission, 2 Puncture Resistant tires front, 2 Steelbelted Heavy Duty tires back inner, 2 Steelbelted Heavy Duty tires back outer, Driver w/10-pt. CA, Gunner w/SWC and 10-pt. CA, 3 Linked Variable Fire Rocket Pods Front, Spikedropper Back w/10 Spikes and 10-pt. CA, Plastic Armor: F55, L30, R30, B25, T6, U10, 2 Fake Wheelguards Back, 2 Fake Wheelhubs Front, Gear Allocation: [13 lbs. ], Acceleration 2.5, Top Speed 35, HC 2, 7,187 lbs., $24,998. Dirge Mid-sized, Extra Heavy chassis, Heavy suspension, Large power plant, High Torque Motors, Improved Fire Extinguisher, 4 Solid tires, Driver w/SWC and BA, 2 Laser Guided Armor Piercing Heavy Rockets on Rocket Platform, Laser Front w/Laser Guidance Link, Rocket Launcher Front w/10 shots Laser Guided Armor Piercing, Gas Streamer Back w/2 shots Paint, Heavy Duty Brakes, Link (both Front weapons), Link (both HRs, Laser, RL), Plastic Armor: F50, L30, R30, B30, T10, U15, 2 10-pt. Wheelguards Back, 2 10-pt. Wheelhubs Front, Acceleration 5 (+5 w/HTMs), Top Speed 92.5, HC 3, 5,760 lbs., $24,615. A quick note on the arena layout: there are two gates in each corner: 1 and 8, 2 and 3, 4 and 5, and 6 and 7. Starting speed was set to 40, with the exception of the two cars that had a top speed of 35. The action started with duellists in their corners exchanging shots with the other car in their area. First blood went to car 10, scoring a Heavy Vulcan hit on car 18. Fire was exchanged in the various corners and progressed to the upper deck, with the durability of car 23 being on display as it shrugged off fire from both cars 37 and 31 with minimal damage to its metal armor. Car 55 got an ugly surprise of a triple batch of flaming oil on the ramp as it tailed #23. The battle's first kills occurred when car 55 T-boned #31 at 80 mph on the upper deck, resulting in the wreck of both vehicles. Combat continued on the upper deck, with the several vehicles exchanging fire with mixed results. Car 23 narrowly dodged a head-on collision with car 18 on one of the ramps and headed down to exchange fire with car 10 in the corner. The battle on the upper deck continued, with cars 18, 29, 37, and 63 exchanging fire and producing a prodigious amount of debris and obstacles. Car 29 opted to leave the fray, driving off the upper deck and landing in the corner where cars 10 and 23 were exchanging fire. Car 63's racing slicks had a rather bad encounter with the debris and obstacles on the upper deck, resulting in a 4 tire blowout. Running on nothing but the rims, the car careened off the upper deck into the corner where 10, 23, and 29 were duking it out right as car 10 heads up the ramp. The two vans (18 and 37) duke it out up above, with car 10 adding to the mix, resulting in #18 skidding around madly after a collision with #10, ending up with its back facing #37. Car 37 opened up with a 15 rocket barrage into the back of the black van. Damage penetrates, killing the gunner and damaging the engine. Moving at low speed 18 tries to maneuver, but a second barrage finishes the vehicle, leaving #37 in the lead. In the meantime, car 63 manages to land without crashing and continues scraping along with a handling class of -6. A hard turn combined with weapon fire causes #23 to roll, heading straight for the main bunker. #29 and 63 start exchanging fire. Car 18, moving at 5 mph off the upper deck, lands nose down in the corner where the trio are exchanging fire, with #37 headed this way and car 10 coming about as well. Car #23 catches an unexpected break when the collision with the bunker causes the vehicle to end its roll on its wheels. It's starting to look like the climax of the battle will take place in the corner. #37 loses three tires to debris: one on the front and one each on the back wheels. A bit of luck and its six-wheeled chassis leaves #37 moving with 3 tires still intact. Looking to join the fracas, it jumps off the upper deck past the wreck of car 18. Cars 23, 29, and 63 were jockeying for position in the meantime. Car 23 has breached armor on its right 63 and 29 are both suffering damage on multiple sides. Adding 37 to the mix, 10 bearing down on the ramp, debris and obstacles littering the corner, and the timed end of the game closing in, the tension is mounting. Car 63 is continuing to be hounded by 29's laser fire. The solution? Five car lengths of laser-impermeable smoke, courtesy of a back-mounted gas streamer. Number 23 is switching fire between 29 and 63 as targets present themselves. Car 37 has nearly completed its turn to bring its VFRPs into the fray again. Number 37 unloads a full salvo of the VFRPs on 63's side, looking for a second kill. 18 rockets launched. 4 hit. Nine points of damage – not enough even for debris. Sloped compacts are tough to hit. Car 29 is headed towards the same ramp that 10 is headed for. 23 continues to pursue 63. 63 puts out more smoke to try to protect its back, but a bit late. 37 launches at 63 at the same time – 15 rockets, yielding 10 hits. The damage smashes through the back armor, destroying the gas streamer, blowing holes in the gas tank, and injuring the driver. 63 maneuvers to protect its back as 37 and 23 close in. Car 37 and 23 are trying to get a line on 63's back. 37 hits more debris and the other three tires go, sending the van into a roll, with 23 close behind. Number 63 scrambles to get out of the way of the oncoming van and 23 manages to punch damage through the underbody of the rolling van, destroying its engine. 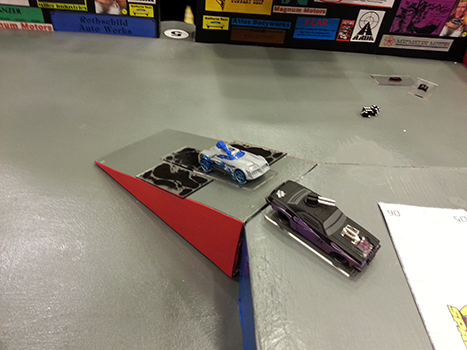 As time is running out, cars 29 and 10 play a game of chicken on the ramp. Debris settles the issue as car 10 loses all 4 tires, skidding off the ramp and into a head on collision with car 29. Despite last minute breaking by both cars, closing speed is over 100 mph. And both cars have carbon-aluminum frames, resulting in double damage. Both cars are within 20 points of being confetti. And dead, with all of their internal components, drivers included, being destroyed. Leaving just the last three competitors. The final turn is announced due to time constraints. The van collides with the wall, ending its roll upright. 63 spins around to take a final shot at 23, breaching the left armor, but with no internals. Car 23 takes a final shot at the van, unable to breach its armor. The game is called for time. 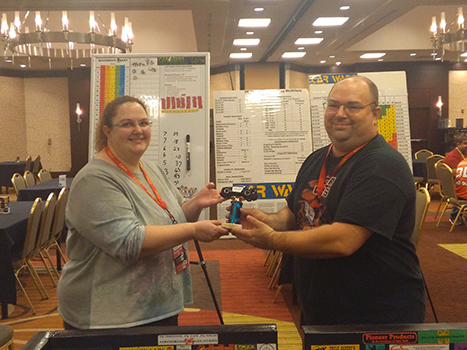 Of the three surviving duellists, car 37, driven by Becki Brotman, by virtue of its kill of car 18, is awarded the victory, taking home the trophy for OrcaCon 3. Congratulations, Becki! For more information on the final, check out the pre- and post-game interviews of the finalists by the Geeks of Cascadia and also the Twitter feed from Car Combat Central on January 13-14. For those looking to join in the fun, this Car Wars tournament will be returning to OrcaCon in January of 2019, and will also be held at Dragonflight in August of 2018. A big thanks to Michael Owen for helping and live-tweeting the final, the Geeks of Cascadia podcast for their coverage of the event, the OrcaCon staff for putting on a great convention, the folks who helped with the arena disassembly and cleanup in the wee hours of the night, Aaron Mulder for his incredible Combat Garage which was used for all of the designs, my wife for putting up with having half painted arena pieces all over the house for several weeks, and to all of the players and spectators of the event. All of you helped make this a major event for the convention and for Car Wars. To everyone, watch your handling and remember to Drive Offensively.